So after the disappointment of getting my dink from Austin, I needed some upliftment. Luckily Mira Nair provided it in spades at the IFP’s Independent Film Conference in New York last week. She described needing elephantine skin to survive the ups and downs of Hollywood. That and amazing self-belief. With every “No thanks. Not for us,” she told herself, “You’re wrong. I’ll show you.” And it’s turned out pretty well for Mira. That’s the spirit I find myself trying to tap into for the much needed rocket fuel to keep the momentum on crazy Bollywood movie musical going. If making a film is like going to war, it’s a mighty long campaign. Mira’s keynote also had two pieces of great advice for Third Worlders…stuff I’ve felt but not been able to articulate. 1) Make what you make excellently. Do not apologize for its quality by saying explicitly or not, hey this is from the Third World so cut us some slack. For her first feature “Salaam Bombay” she told the story of blowing the entire movie’s budget in production, leaving nothing for post. She put all the money in the film ($800,000) and then went looking for finishing funds. She just knew it had to look great. 2) Don’t “anthropoligize” or explain too much culturally. If you watch Monsoon Wedding you’ll see how much you’re thrust into the action. There’s no expositional dialogue about why we dress this way or wear this henna, or sing this song. There’s no outsider leading you through the action and the work is all the richer and more authentic for it. Whichever it was, it didn’t stop her from plugging “Amelia”, her first big studio movie, starring Hilary Swank, which opens October 23rd. I’ll admit it. I did have high expectations going in to see Kaminey. And despite getting yet another dose of Mumbai gangsterism, my expectations for the next Vishal Bhardwaj movie remain high. The Bombay mafia has been depicted in Bollywood as early as Awaara (”it was called Bombay then” just as Guddu articulates on our desperate behalf), and there’s been a steady dose since. The frequency ratcheted up after Nayagan came out in the 80s. Since then we’ve gotten Zanjeer, Don, Deewaar, Parinda, Satya, Company, Sarkaar, Munnabhai, Godmother, Waisa Bhi Hota Hai, Vaastav, and perhaps many more that I’ve never heard of. Do we really need another Mumbai gangster movie? Obviously, Vishal Bhardwaj and his brothers in arms believe so. As a result, we’re treated to Mumbai slang, incessant rounds of firing, shootouts, crass dialogue, guts and glory, greed, family values among thieves – the usual smorgasbord that makes up this weary genre. But since this is Vishal, we get a movie that’s pretty damn good, with moments of brilliance, some great music and background scoring, and a couple of clever send-ups. We could start with the satirical insertion of the twins genre twinned with the gangster genre. But it’s not brothers separated at birth. It’s brothers that have drifted apart because they are different. Each of them has frailties, physical and mental, that make them hero and anti-hero at the same time. Thus, the layers begin, and we get a movie enriched in its underpinnings. There are send ups of Maharashtrian zealots, politicians, rogue police officers – all the usual suspects we have seen before. But the quality of the acting, the development of the characters, and the tightness in script differentiates this movie from its many predecessors. Amole Gupte is excellent as Bhau, Priyanka Chopra is almost unrecognizable when she actually acts, Shahid does a reasonably good job, and all of the supporting cast are very good. What stands out is the attention to detail. All speech defects and accents are maintained, the story retains continuity even as it hops back and forth. Perhaps the only tenuous moment was when Bhau speaks English with an impeccable accent. Yet, In today’s India, that may be a possibility. There are some brilliant scenes. The interrogation of Guddu is one of my favourites. To explain what happens would give away the scene, but it is extremely funny, sad and scary at the same time. The shoot outs are superbly executed. And the first song during the titles is Vishal Bhardwaj doing what he does best, composing and arranging music. It is an excellent rendition of a folksy tune with a superlative musical arrangement. As Sukhwinder sings the song with gusto, one feels that it resumes from where the title song of Omkaara left off. There are hints of Reservoir Dogs, Lock Stock and Two Smoking Barrels, Layer Cake, and a general whiff of Quentin Tarantino’s “influence” in many scenes. No copying however, or sincere flattery, just influence. There are a couple of scenes though that really feel like run of the mill. It was Dil Chahta Hai Redux or Yuva II (the Fanaa song) during the nightclub song scene. Nightclub song sequences seem to have become a template, like the hero and heroine running towards each other in slow motion with a Kenyan runner’s stamina on open hillsides. The shoot out, although well done, is also a template. The ending is a bit of a cop out, but you have to wait to the end to see it. And while you’re waiting, it’s a rock and roll’r. However, one hopes that this is the last Mumbai gangster film that Vishal Bhardwaj makes. It’s a waste of his calibre to add yet another nine pin in the bowling alley of gangster movies. It would have been interesting if he had made the Hyderabad or Bangalore underworld his subject rather than Mumbai. Whatever happened to his idea of creating a legacy of children’s movies? He’s only made two so far, Makdee and The Blue Umbrella. He could even take some other relevant topical story, whether it be the ineffective judicial system or the many million stories of success against the odds, and make a smashing film out of it. He is one of the few movie makers who can pull it off, and the movie industry would be all the better for it. There is a story about Buddha when, as Prince Siddhartha, he set out on a journey during which he encountered three men – one old, the other two sick and poor – and then a corpse. This led him to give up his riches and seek the meaning of life. In Walter Salles’s The Motorcycle Diaries a young Ernesto Guevara de la Serna set off on a similar journey, with the intent of having fun, especially experiencing the company of women. But along the way he encountered poverty and the harsh realities of the underprivileged in Latin America. This discovery made him change the course of his life, leading him eventually to become the hero of the Cuban Revolution. I thought of these two journeys last week, while watching Dev Benegal’s haunting and visually stunning film Road, Movie at the Toronto International Film Festival. In the film, Benegal’s protagonist Vishnu (Abhay Deol, in a far quieter and introspective role after his showy performances in Oye Lucky! Lucky Oye! and Dev D) travels through a mythical landscape in India, traversing across the desert in Rajasthan and the salt lands of Kutch. But Benegal (English, August and Split Wide Open) does not start the film with lofty and visionary goals for Vishnu. The man is escaping his father’s dying hair oil business and finds something else to preoccupy himself – a favour to drive a broken down truck with old movie projectors and film reels. Along the way Vishnu meets several colourful characters – including a young boy (Mohammed Faizal), an old man (Satish Kaushik in his career best performance) and a gypsy woman (the seductive Tannishtha Chaterjee, who is fast becoming the leading lady of the Indian indie cinema). They set off on a colourful magical mystery tour in the truck, and share experiences that may not happen in the realm of reality. There is reality in the film and then beyond, but it is all very satisfying for the senses. Benegal’s travellers stop to show movies to villagers, allowing them to dream and escape from their harsh state of poverty and desperate shortage of water. Vishnu’s three travelling companions play diverse roles in his journey. The child reminds him of simple pleasures of life, innocence and the importance of a sense of humour. The old man, a fatherly figure who helps guide him through the rough terrains of his internal and external journey, gives him advice on life lessons. And the woman shows Vishnu his caring, sensitive side, in addition to seducing him. Also during this journey Vishnu sees a group of women walking long distances in search of water. The women are like a Greek chorus, or the Goddess of Rajasthan, appearing in the film in the far-off landscape, but watching and never letting Vishnu get completely lost. He is tested but never allowed to fail completely. Vishnu does not become Buddha in the end, but he certainly feels in control of his destiny. Life lessons apart, Road, Movie is a very funny film. It has a terrific and a witty script written by Benegal and is tightly directed. Benegal’s narrative is aided by bright upbeat soundtrack by Michael Brook (a collaborator with Nusrat Fatah Ali Khan, who also composed for a number of films, including Sean Penn’s Into The Wild), and stunning camerawork by Michel Mathieu. The film is full of so many visual wow moments – large expanse of landscape, the overbearing desert and the magical truck, peppered with the colourful costumes of the characters. There are moments when we feel the truck is within us and the audience is on the same journey with Vishnu and his co-passengers. And then there are moments of stillness, such as when the four characters first step on the salt land in Kutch. That single shot takes your breath away. Finally Road, Movie is Benegal’s homage to the magical world of cinema. The film is full of charming and sometimes hilarious movie clips, and a playful version of a classic Bollywood song that will surely have the audience smiling as it leaves the theatre. The 14th Pusan International Film Festival (PIFF) has announced that legendary Bollywood director-producer Yash Chopra will receive its Asian Filmmaker of the Year award. Chopra also founded Yash Raj Films in 1970 which has churned out more than 40 films. Chopra directed 12 of these, starring Bollywood icons such as Amitabh Bachchan and Shahrukh Khan. Yash Raj Films has also joined with Walt Disney Studios to create a series of animation films and premiered the first co-production Roadside Romeo last year. Previous awardees of PIFF’s Asian Filmmaker of the Year since it was inaugurated in 2003 include Mohsen Makhmalbaf, Hou Hsiao Hsien, Andy Lau and the late Edward Yang. The 14th Pusan International Film Festival will run October 8 -16. As the end credits of Harishchandrachi Factory (Harishchandra’s Factory) roll, the only question that strikes you is: Why did no one ever think of making a film on this subject before? The story of the birth of the world’s largest film industry is a riveting one, and debutant director Paresh Mokashi does it ample justice. His Marathi film, on the making of Dadasaheb Phalke’s Raja Harishchandra—India’s first film—is entertaining, absorbing and affecting to the core; truly worthy of its selection as the Indian entry at this year’s Oscars.“We know Phalke as the father of Indian cinema, the guy after whom the country’s most prestigious film award was named,” says Mokashi, but, as he points out, we know little else. His affectionate tribute to the man who, with 95 movies and 26 short films to his credit, laid the foundation of our booming film industry, more than fills the void. Mokashi portrays Phalke in all his complexity, focusing on his life between 1911—when he was first introduced to motion pictures—and 1913, when Raja Harishchandra was released. Phalke, the film tells us, got hooked to cinema after a show at Picture Palace, and captures his fascination for it rather tellingly, in a single shot. While the audience is busy watching the film, Phalke is shown with his back to the screen trying to figure out how images are being projected onto the screen. He does everything he can to learn the craft—from selling off household goods to almost losing his sight. Driven, obstinate and dogged, he brings a Williamson camera home from London, where he goes to learn filmmaking. And then uses it to shoot a film on the growth of a pea plant, which wins him investors for his maiden feature.Craft apart, Mokashi’s Phalke also seems to have a prescient understanding of the medium’s potential. He makes a strong case for India courting cinema, warning if it doesn’t, “The country will lose a profitable business.” And he seems to know all about the power of marketing, offering, as he does, nine-yard saris to winners of a “lucky” Harishchandra movie ticket! Lead actor Nandu Madhav’s Phalke is mad yet utterly loveable; a refreshingly buoyant portrayal of a cinema veteran usually associated with staid sobriety. “We have an obsession with portraying our historical figures seriously. Gandhi had a sharp sense of humour but we never want to show that,” says Mokashi. Phalke’s family is just as winsome. His wife Saraswati, who gamely tries her hand at cinematography, and his two good-natured, playful boys stick with him in his endeavours, despite financial ups and downs. A light-hearted spirit permeates the entire film; the scenes dealing with the shooting of Raja Harishchandra are especially hilarious. Phalke can’t find women willing to act; even prostitutes are offended by his offer of roles. Much humour is generated as Phalke is compelled to pick actors off the streets, and force men to play women by shaving off moustaches and donning saris. On an outdoor shoot, he has to convince the police that his cast consists of actors, not thieves. And he advises his actors to tell anyone who doesn’t know what cinema is that they work in a factory. Thus, the title. Mokashi’s film is straight and simple and a trifle old-fashioned; the director, who is primarily a theatre person, prefers to avoid what he calls the “larger than life” approach of Bollywood and Hollywood. To an eye attuned to the zip and energy of contemporary cinema, Mokashi’s shots might seem static and stagy. But not his layered narrative, which skilfully weaves in the politics of the times. A neighbour jokes with Phalke that the British will banish him to Mandalay, like Tilak, for stealing their cinema business. But it’s not just business: Mokashi’s film makes it clear that Phalke’s choice of subject is a political act—his films have to reflect Indian culture and sensibility. Shortly after Raja Harishchandra releases, we are told Tilak is out of prison and a world war has begun. And Phalke? Well, he is on to making Bhasmasur Mohini and Satyavan Savitri. From Saif and Kareena to the Bachchans, from Katrina Kaif to Karan Johar, it was a starry starry night on Sunday evening in Mumbai where celebrities from every field including Bollywood turned up in large numbers for an award ceremony for a leading men’s magazine. They walked in hand in hand and walked out with an award each. It’s not everyday that Saif Ali Khan and Kareena Kapoor make public appearances like this. But even before their latest film Qurbaan has hit the big screen, the couple are lapping up honours together. Next best in line was Big B and family in all their style and glory. Amitabh Bachchan, who received the Lifetime Achievement award said, “Well, now I’ll have to make more space to fit in yet another award.” But for some of the younger stars just being appreciated meant a lot. Abhay Deol who picked up the Breakthrough Talent title. A few weeks back I saw two movies screened at MoMA’s The New India exhibition. The audience for both the screenings was fairly similar, mostly brown with a smattering of white, but the response was dramatically different. New York Film Festival 2009 Opens Tonight! Tonight, the 47th New York Film Festival opens in the newly renovated Alice Tully Hall! “Made by Ilisa Barbash and Lucien Castaing-Taylor without supplemental commentary and with great attention to beauty, this observational documentary focuses on Montana sheepherders who run their flocks up mountains in the summer to graze, grindingly difficult work that only looks romantic,” -Manohla Dargis, The New York Times. Mussolini’s “secret” marriage to Ida Dalser, afterward completely denied by Il Duce, along with the son born from the relationship, becomes the springboard for Marco Bellocchio’s visually ravishing meditation on the fascist manipulation of history. “Sensationally acted,” raves the New York Times. A “gem,” says the New York Times. One hundred years young, director Manoel de Oliveira returns with another gem: a wry, moving tale of a pure if frustrated love adapted from a novel by Eça de Queiroz. One of the Festival’s most memorable and singular selections! This vision of shipboard revolt may not be Potemkin redux, but, its postmodern gags, manga influences and spikey haired actors notwithstanding, it’s not so far away. These extraordinary special events will bring you closer to the filmmaking process, and expose you to Masterworks rarely screened. In conjunction with the Special Presentation of the magnificently restored The Wizard of Oz, this panel discussion will focus on the place and continuing impact of the film even seventy years after its initial release. Marco Bellocchio (Vincere, NYFF09) has been one of the most perceptive and provocative chroniclers of all things Italian, from the Church to family values. Mr. Bellocchio will discuss his development as a film artist, the important focus on “outsiders” that has proved a constant theme in his work, as well as his thoughts about the future of Italian cinema. This film series presents 20 films from the so-called “Seventeen Year” period-from the founding of the People’s Republic of China to the outbreak of the Cultural Revolution-that sought to respond to debates about what kind of cinema this “New China” should have. The Indian Films – Studio 18 presented Road, Movie had a grand premiere at Toronto’s historic and cavernous Winter Garden Theatre on September 18. The Dev Benegal-directed drama, the only Indian feature to be invited as a special presentation at the recently concluded Toronto International Film Festival, was incredibly received by the media and audience alike, culminating in a standing ovation from a diverse audience. Abhay Deol, acclaimed Brick Lane actress Tannishtha Chatterjee, Satish Kaushik, production designer Anne Siebel, cinematographer Michel Amathieu, editor Yaniv Dabach, costume designer Amba Sanyal, producer Susan B. Landau, co-producers Fred Berger and Sopan Muller, director Dev Benegal, presenters Sandeep Bhargava and Vandana Malik, and senior officials from the international operations team of Studio 18 emerged from the jet black limos that rolled outside the illuminated venue. Several pre-screening activities by the producers, including celebrity parties, media interactions and giveaway contests around Road, Movie, created a weeklong buzz in the festival circuit, enabling the premiere to be sold out days in advance. Studio 18’s after-screening party held at a plush vodka bar was a smash success, attended by leading society and media figures from Toronto city. Road, Movie tells the story of Vishnu, a restless young man, who rejects his father’s faltering hair oil business and hits the road with a travelling cinema. Colorful and full of unforgettable characters, the film celebrates India’s open road and the pure love of movies. In a bid to augment the curiosity around the film, the producers abstained from revealing the film in public domain, and unveiled its first look and website just days before the premiere. At The Atelier, Cannes 2006, the script of Road, Movie was an official selection, and at Cannes 2009, Indian Films-Studio 18 inked a major deal with global sales giant, Fortissimo Films, to represent Road, Movie internationally, the latter’s first Indian take-up. Sign Up for Karavan Film Club! Karavan Film Club is a quarterly DVD club that delivers cutting-edge South Asian cinema, from festival favorites to critically acclaimed releases, straight to your mailbox, anywhere in the US. A partnership with Film India Worldwide provides members access to the premiere South Asian film commentary magazine, edited by Uma Da Cunha, and available now for the first time to US readers. Premium benefits include VIP invitations to premieres, parties and panels, with cast & crew in attendance in cities such as New York, Chicago, Detroit, San Francisco and more. Subscription to the Film Club provides DVDs of Karavan Kollective titles as well as additional films only available through Film Club subscriptions. New York, NY September 17th, 2009: The Mahindra Indo-American Arts Council (MIAAC) Film Festival announces the Opening, Closing & Centerpiece Films for its 9th Annual Festival in New York City. Following hot on the success of the 2008 festival, which saw a stellar line up of films and talent including the NY premiere of Oscar-winning film “Slumdog Millionaire,” this year’s opening film is “Today’s Special.” Directed by David Kaplan, the film is written by and stars Comedy Central star Aasif Mandvi; accompanied by renowned Indian actor Naseeruddin Shah as well as author and actor Madhur Jaffrey. Tennis celebrity and media executive Vijay Amritraj will present Santosh Sivan’s “Tahaan”, set in Kashmir, as the prestigious Festival Centerpiece. The festival this year packs a bang with the closing film “Antaheen – The Endless Wait” starring two film luminaries discovered by Satyajit Ray – Sharmila Tagore and Aparna Sen – both of whom will attend this U.S. premiere at the Walter Reade Theatre, Lincoln Center. MIACC 09 will run from November 11-15, 2009 and all public screenings will be at the Quad Cinemas, New York City. MIAAC Film Festival once again sets the stage for some of the most highly anticipated films of the year. Presented by the Indo-American Arts Council in collaboration with the Mahindra Group, MIAAC showcases the best of Indian cinema from India and the Diaspora. The centerpiece film is Santosh Sivan’s film “Tahaan” and is about the adventures of a little boy and his pet donkey in militant Kashmir. It has won myriad accolades at international film festivals and will celebrate its NY Premiere at the MIAAC Film Festival. Closing film “Antaheen – The Endless Wait” by director Aniruddha Roy Chowdhury brings Satyajit Ray’s two actresses’ – Sharmila Tagore and Aparna Sen together on screen for the first time. Set in modern day Kolkatta, the film crisscrosses between the loves, passions and relationships of these two actresses. These three films represent the festival’s focus, genres, and themes – from independent films to Diaspora artists; from New York to the new Global India; from social concern to romantic comedy. Celebrities who will represent these three films at the festival include the entire New York cast of ‘Today’s Special’ led by Aasif Mandvi, Naseeruddin Shah and Madhur Jaffrey; Santosh Sivan, Vijay Amritraj, Aparna Sen, Sharmila Tagore, Kalyan Roy and Aniruddha Roy Chowdhury. MIAAC 09 will announce the complete lineup of films, programming and celebrities in the first week of October. Tickets prices will be $15 general admission; $12 IAAC members & students w/ID. Public screenings of the films will be at the Quad Cinemas. US, 2009, RT. 90 mins. NY Premiere. Inspired by Aasif Mandvi’s Obie Award winning play Sakina’s Restaurant, “Today’s Special” is a heartwarming food comedy set in New York City. Samir (Aasif Mandvi) is a Sous Chef who dreams of being Head Chef of his boss’s hot new restaurant. After being passed over for the promotion, he abruptly quits and hatches plans to go to France and study under a legendary Chef. But when his estranged father, Hakim (Harish Patel), has a heart attack, Samir’s life takes a detour back to his parents home in Jackson Heights, Queens, where he takes over the failing family business: Tandoori Palace. With one foot out the door, Samir must come to terms with the loss of his older brother a few years back, and the sadness that engulfs his parents. Tahaan lives with his family in the Kashmir valley. The eight-year-old’s father has been missing for over three years. The local moneylender takes away the family’s assets including Tahaan’s pet donkey, Birbal. The boy is determined to bring Birbal back home but is told that an old man (played by Anupam Kher) bought the donkey. Tahaan goes in search of the old man but finds he has to do a teenager he meets a favor to get Birbal back. Director Sivan, who had previously shot Mani Rathnam’s Roja in Kashmir, developed his fable-like screenplay after reading a story in an Indian newspaper. With Purav Bhandara, Anupam Kher, Rahul Bose, Rahul Khanna, Victor Banerjee. Santosh Sivan and Vijay Amritraj in person. Story and Direction by Aniruddha Roy Chowdhury. A new Kolkata glitters to life, all intelligence and smooth surfaces, as loves, passions, and relationships crisscross in a shifting web brought to the screen. Abhik, a police officer, loses faith in the real relationships and seeks solace in the virtual world where he develops an online relationship with Brinda, a journalist. Ranjan and Paromita, an older estranged couple, become the bridge between the two younger lovers, nursing as they do their own separation and tenderness. The Endless Wait brings to the screen some sterling performances, including Satyajit Ray’s legendary discoveries, Sharmila Tagore and Aparna Sen, in their first film together. Also with Rahul Bose, Kalyan Roy. Aniruddha Roy Chowdhury, Aparna Sen, Kalyan Roy and Sharmila Tagore in person. Gabhricha Paus (The Damned Rain) gets its US release at Facets in Chicago. First Marathi film to get a arthouse US release. 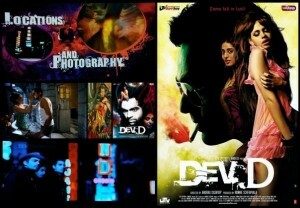 Probably the first Indian film to be shown at Facets. I don’t know if they showed the The Terrorist there. Nevertheless a moment of pride for India and Indians and Desi’s. An achievement that i envy and i wish some day i will be able to make a film that shows at Facets. Spread the word and make this a success. Following is the schedule. Here is hoping that it does well. Spread the word. The summer is finally over, but for movie lovers it is sign of hope and excitement, since it is also the beginning of the fall film festival season. And heralding the season is the Telluride Film Festival — held each year over the Labor Day weekend. There are world and North American premieres before the films make it to bigger and flashier events in Toronto and New York, revivals of classics and even lost silent treasures. Last year the Telluride audience was the first in the world to see Slumdog Millionaire. It is a spectacular setting to see films – the pristine San Juan mountain range in Colorado, a former mining town, where Butch Cassidy first robbed a bank and Tom Cruise makes a home. Cruise has never been spotted in the town during the festival, but there was enough star power at this year’s event – from Viggo Mortensen and the French legend Anouk Aimée (both honored at tributes to their careers), Nicolas Cage, directors Alexander Payne and Jason Reitman, and the radiant Helen Mirren. In the recent years Indian cinema and film personalities have received the rightfully deserved recognition at Telluride. Shyam Benegal and Om Puri have been saluted with tributes to their careers, and in 2001 Salman Rushdie was a guest programmer at the festival. And the festival has shown films ranging from The Namesake, Firaaq, and The Mystic Masseur to classics like . This year the festival picked up veteran Bengali director Buddhadeb Dasgupta’s new film Window. A quiet, poetic film Window follows the journey of a young man who buys a new window for his rural high school only to find his good intentions ridiculed and rejected. The film has an ironic tone, but the supporting cast is uneven and somewhat theatrical and that defeats Dasgupta’s efforts. There were two other films with the South Asian flavor. France’s Rachid Bouchareb has directed a heart-wrenching film — London River, a story of two strangers, a British mother and a French African father, searching for their children, lost in the aftermath of the 2005 London bombings, caused by immigrants of Pakistani origin. Brenda Blethyn is terrific in the role of a clueless mother who over the course of the film learns so much about her missing daughter’s life. And finally we saw an oddly constructed, rambling Australian documentary The Miscreants of Taliwood, in which the filmmaker George Gittoes travels through the Taliban-controlled parts of Pakistan as he explores the regions so-called film industry. The actors he meets are crude performers and their films are very amateurish and uninteresting. The Miscreants of Taliwood is very disappointing and certainly not festival material. After a sold-out festival last year, the Sikh Heritage Film Festival is back to celebrate the rich heritage, traditions and culture of Sikhs and the immigrant experience through a diverse mix of features, shorts and documentaries. Come and be a part of this experience, which promises a weekend of great films, fabulous parties and an eclectic mix of guests and supporters. FilmKaravan is proud to be a partner of this amazing event! Use special code FLK2009 for discounted tickets. Selected films from the program highlighted below. My Mother India is a passionate film told through the eyes of a child from a mixed marriage, set against the tumultuous backdrop of modern Indian history. This semi-autobiographical art documentary film explores the making of and inspiration behind Nineteen Eighty Four – one of the most celebrated paintings produced by internationally acclaimed contemporary British-Sikh artists, The Singh Twins, which depicts the Indian government’s military attack on the Sikhs’ holiest shrine – The Golden Temple — in Amritsar in 1984 and presents a very personal perspective on what many regard as one of the most tragic and misrepresented events in modern Sikh history. Bhangra Generation is an electrifying, entertaining and enlightening documentary on the fast-growing phenomenon known worldwide as Bhangra and how it has influenced the young generation of South Asians in the West. Yellow cab drivers from South Asia navigate the chaotic urban terrain of New York and talk about their experience post-9/11 as they interact with people from all walks of life. In particular, Sikh taxi drivers speak of racial profiling and how their appearance leads to discrimination, while Muslim drivers echo this sentiment when they say that terrorism is not linked to religion.